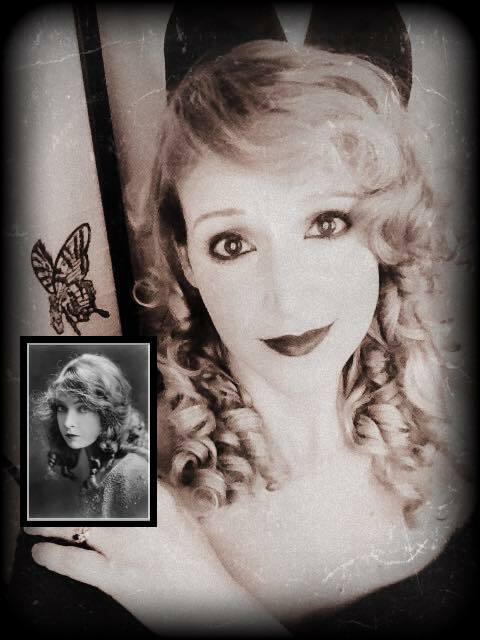 For those of you who didn't know, I am pursuing a project right now that involves quite a little bit of leg-work...creating a hair/makeup tutorial inspired by each year of cinema, starting with 1920. The first installment of this series is discussed in detail back in my November Post featuring that video. 1920's re-creation was dark and dramatic, inspired by the first horror film (debatably), The Cabinet of Dr Caligari. This one was no less daunting however, since it was inspired by another signature look of the decade. 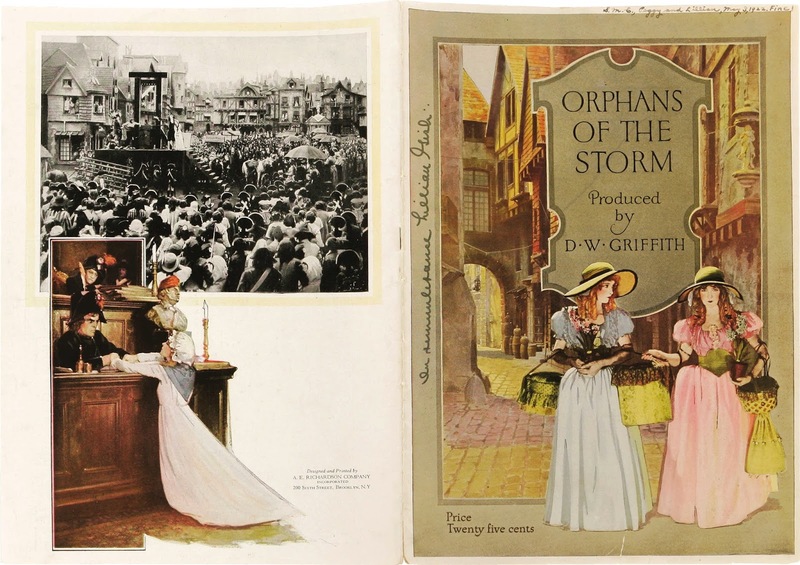 1921 saw the monumental success of one of the world's first 'epic' films, Orphans of the Storm, starring the beautiful and precocious Gish sisters. The wan, almost feline face of Lillian Gish was especially appealing to me as was the dramatic makeup application that captured the youthful determination of the girls. The hair was another integral look of the decade, long untamed locks that hung in sausage-like ringlets at the ends. Orphans of the Storm is set during the onset of the French Revolution, and plays out in a sweeping scale over the course of almost two and a half hours. Lillian and Dorothy play Henriette and Louise respectively, sisters who are suddenly orphaned and left to fend for themselves in a small village outside of Paris. Although they bear a striking resemblance, Louise is actually a child of the aristocratic class, who was abandoned by her mother during infancy. The sisters are as close as any fleshly sisters could be and depend on one another entirely, especially since Louise is blind. 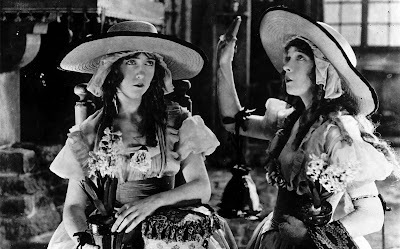 Upon hearing that there may be a doctor in Paris who can possibly cure this affliction, Henriette and Louise journey to the city, where they are immediately taken advantage of and separated amidst the eruption of the Revolution. Henriette befriends a young man of the aristocracy, Chevalier de Vaudrey, who becomes infatuated with her and promises that he will help her find Louise no matter the cost. As the world literally burns around them, the two sisters must decide whom they can trust and pray for salvation from the chaos that follows. D.W. Griffith directed this movie with the same unique style that served him throughout his career. It's bold and daring...epic in every sense of the word. The sets are enormous and beautifully detailed, the costuming is elaborate, and the cast is huge. While some films of this kind, especially during the silent era, have a tendency to be long-winded and difficult to follow, Orphans does not fail in this regard. The title cards are placed frequently throughout the film, where needed, but not so often that they break up the flow of the moving story. He also capitalizes flawlessly on the popularity of Lillian at this time, giving her the largest, meatiest role. On multiple occasions, the camera zooms into her beautiful face and takes full advantage of the gift she had for conveying emotion with a look or a slight tilt of her coquettish mouth. 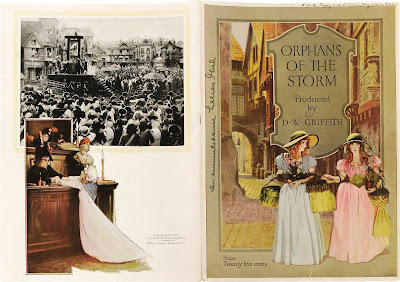 Orphans of the Storm should definitely be seen by any who have a love for the epic period-piece since almost all films of this genre were inspired by it. At the ripe old age of 40, I'll admit it was a bit difficult to capture the childish beauty of the Gish sisters, but hopefully the tutorial proves to helpful for all ages. The secret of the look is the feline look of the eyes, while still keeping the lips distinctively small and the skin fresh. 'Fresh' is relative in this case, of course, since the look of the day was obviously on the pallid side. But that said, there is a youthfulness that is important to the aesthetic of this style, so starting with an illuminating and moisturizing base was important in the makeup application. For the hair, I utilized the 'Tressmerize' extensions again, pre-rolling them in small rollers and only brushing out the tops of the sections so as to blend them into my own hair, which was also rolled in small rollers and released carefully to preserve the locks. When styling the hair, please refer to the technique in the video, which focuses on preserving the outer curls and harnessing the natural frizz at the roots. For the base, I applied Clarins Instant Light Skin Perfector, which is a radiance boosting base. A full coverage foundation with a satin finish is a good option. For this one, I used Estee Lauder's Double Wear foundation, in the shade Ecru. Set with Original Dermablend Setting Powder-no substitutes here, please. My eyeshadows were all matte, and not brand specific. Any good quality shadow can be used for this tutorial and will have a similar effect. Eyes should feature waterproof eyeliners and mascaras, however, since the application must be somewhat heavy to mimic the look of the era. However, any brand will suffice. The same goes for lip and cheek products, which are only going to be based on color and finish at this point. 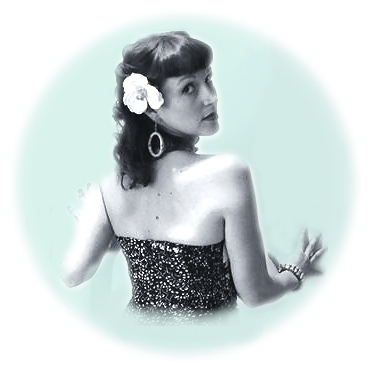 A recommendation for a good deep red shade would be Julie Hewett lipstick in Sin Noir. It's a long time favorite of mine for the classic vamp lip. The video is linked for you here...enjoy and let me know if you have further questions about the film or the look. Will we be seeing a starlet from 1922 anytime soon? Hi Jocie, I hope this reply shows up to you. Yes, I plan to get on the '21 Starlet in the next couple of months. :) Yay for bobbed hair!